I have lived in the South Shores area of San Pedro, which is not to far from the PBC and Vanderlip Mansion, all of my life and have heard stories of the Vanderlip Mansion since I was about 5 lol. I have had several friends go there, all of them with stories they won't ever seem to forget, yet none of them have ever been inside the actual house. From my understanding the security is very much in effect due to kids constantly going up there before. I've heard several stories, but the most famous is this. Frank Vanderlip a wealthy owner of land here in Palos Verdes went crazy and slaughtered his whole family and buried their remains out on a patio/stage type thing out in the front of the property (which I somewhat believe is true due to the fact that this is where most of the paranormal activity goes on). And as far as the story of his daughter falling in love with a slave, I've heard that was true as well, but his daughter was actually a cripple who was in a wheel chair, and after discovering this he slaughtered his daughter's lover and child. This brings me to the most recent story I've heard from about a month or two ago. One of the girls I work with used to go there all the time, and she made a quick visit not to long ago. Apparently there is a gate not too far from the actual house itself with an open field. Her friend had to use the restroom so the two of them went down into this field (apparently where the old barn used to be) and immediately began hearing sounds of something squeaking almost as if a wheel chair were being moved through the dirt. She had shone her light on an area that had caught here eye down at the ground to see a pair of shoes, followed by two pant legs. As she moved the flashlight up the image seemed to fade out into a smoky type substance, and when she went back down to see the shoes they were gone. I also heard another story of this field of two horses (almost statuesque if thats how you spell it lol), one large white one and a large brown one that seem to disappear into nothing? Also, as far as the slaughtering of Vanderlips Dog's, the rumor is that he took out their voice boxes and they still roam the property so they catch any intruders that lurk by, but from what I've heard this is actually a trick the police have used in recent attempts to stop trespassers, but it still is creepy to hear these dogs rustling around in the brush. Best way to probably get in to Vanderlips is just to wait for someone else to enter the gate and follow behind, the area itself is very trippy from what I've heard, something almost out of a horror movie, and not anything like the rest of Palos Verdes at all. If anyone knows the gate password, or any other stories of Vanderlips I'd definitely be interested to hear. That's a very odd and interesting story. Do you know if there is somewhere we can see pictures? "Do you suppose that human thought has no practical motives, that it is simply the expression of a disinterested curiosity? That is surely very improbable. I believe rather that when man personifies the forces of nature he is again following an infantile model." Just thought I'd add a picture of the area, and one of those weird dogs..
Lovely area, but I agree that it has a creepy look about it (and not just because of the story). The dog looks like an ordinary adult German Shepherd. Do people really remove dogs' voice boxes??? That seems so cruel and I'm not sure that would even be legal...at least I'd like to think not. I am going to go and see if I can find anything about this place on Google, I'll post if I find anything. Scroll down a tiny bit and there is a picture of the front of the mansion (I think). very interesting, you really have to be there at night to understand how creepy this place really is... just driving by the gates to the estates every night on my way home from work gives me the creeps..
music; halloween props & decor; the whispered, magical moments of connection to the universe from which we may learn. An interesting looking place. I love old trees. Dogs can be debarked, which is a surgery that cuts or partially removes the vocal cords. This doesn't address the issue itself of why dogs are barking incessantly, plus the vocal cords have a tendency to grow back somewhat. Then the dog makes a really hoarse, raspy bark. So what's the story with the dog in the photo? Dogs can be debarked, which is a surgery that cuts or partially removes the vocal cords. Not very humane, in my opinion. ...although I can think of a few people I've met who I wish would have that done. Whats weird about this dog, was that there were two random dogs in the middle of the road that would not move out from in front of the car. We had a brand new cd that I had just purchased from Best Buy in the cd player of my car, and after we passed the dogs my radio tripped and out and the cd wouldn't stop skipping. It began playing normally and the cd hasnt skipped since I left that area. Coincidence maybe? 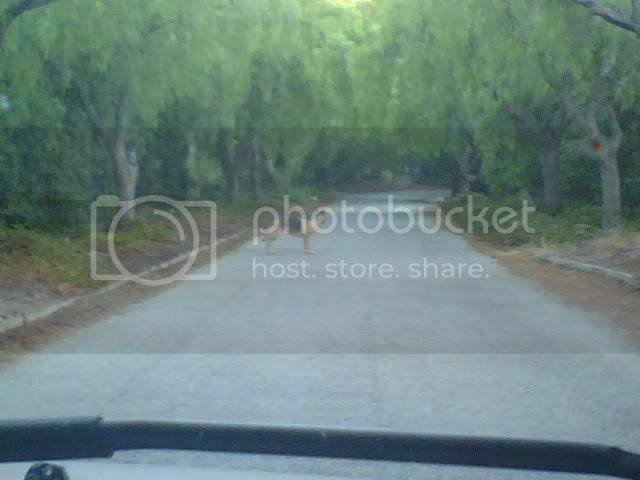 Palos Verdes has some interesting areas, but I don't remember hearing about this place. I house/dog sat in that area a few years ago when I lived in Redondo Beach. Wish I'd have known about it then. Edited by candlewraith, 08 June 2007 - 10:10 PM. Maybe the dogs didn't like the CD. ..... I know, not funny. Maybe it was a coincidence, but that's really weird that it happened just as you passed the dogs. The picture link abstract posted has some information on it about the rumors of a haunting. The page states that it's myth and that Vanderlip has 6 kids and led normal lives. It also goes on to say that the property is still owned by the Vanderlip family. Maybe the legend is about some other family -- because at least 3 of the Vanderlip children outlived their father, and one was still alive at the turn of the millenium. Frank Vanderlip Jr -- third child, first son 1907 -1993 was persidnet of the Palos Verde Corporation after 1956. His widow owns the main house if she is still alive. John Vanderlip youngest son 1914-2001, He and his wife submitted Oral Histories to PVLD Local History Room in 1975, to the Rancho de los Palos Verdes Historical Society in September 1982, and to the Peninsula Seniors in March 1985. Suzanne Owns the cottage. Many vets are opposed to Debarking surgery, usually the same ones who are against declawing of cats. They look as both operations as harming the animal for the convenience of the humans. I personally agree. What otherly family lived at the vanderlip? wasn't it built by them? I think it was built by the Vanderlips, but since there were at least 3 children who lived to old age, then the story of one of the Vanderlip parents hacking all the children to death can't be true. I just thought (probably mistakenly) that it was more polite to suggest the possiblilty that there may have actually been a parent who hacked her children to death somewhere else and the story got confused with the wonderful old spooky house, rather than just call BS on the whole story. Who hasn't heard this scenario played out before. Just like every state has a phantom hitchhiker and how every abbey and castle in Europe has a blue and gray lady...(Funny how ghosts never have more festive colors). I'm just saying the Vanderlip horror story and the real life Vanderlips don't add up. Sounds like someone took a few elementary school students too seriously. I think it is my miscomunication not yours. I did not mean that you had called the story BS. What I was saying that I had dug up evidence that the story was not true of the Vanderlips, but it could possibly have happened to someone somewhere -- and that it would be rude for me to say BS unless I could prove it never ever happened. There is a certain old house that is now owned by the city, who bought it to tear down to build something else -- but the deal fell through 15 years ago, so the house is still standing there rotting. All the local kids keep trying to break in and get scared, because of the legend of the old maid who's boyfriend dumped her, so she chopped up her parents, and then jumped into the harbor and drowned. Rather than tell the kids that is a load of BS, I just tell them it might have happened in some other house, but certainly not in this one -- The last people to live there were my grandparents, mommom got hit by a car in the 1960's and my pops died of a heart attack in 1971. The city bought it from my uncle in 1972. My mother moved out to get married in 1933, my uncles wife did live there for a couple years during WWII while uncle was in the navy, but she and uncle moved out in 1948. Both my mother and my aunt died in their beds of old age. So what we may have is someone from somewhere adopting an urban legend and using the Vandelip Mansion as a Focus. I'm not saying the slaughter isn't real. Weirder things have happened. Villisca Axe murders comes to mind.